Did Temasek Holdings use Singaporeans’ CPF to invest? You can read about this here. We cannot let up on our fight to demand to the government to be transparent and accountable to Singaporeans on what exactly they are doing with our CPF. The facts need to be known to Singaporeans. If today we cannot retire because we do not have enough in our CPF, we need to know the facts about what the government has been doing with it. On 23 August, there will be the third edition of the #ReturnOurCPF event. In the first edition on June 7, the speakers revealed to you the facts that the government has finally admitted to how they are using our CPF to invest in the GIC. 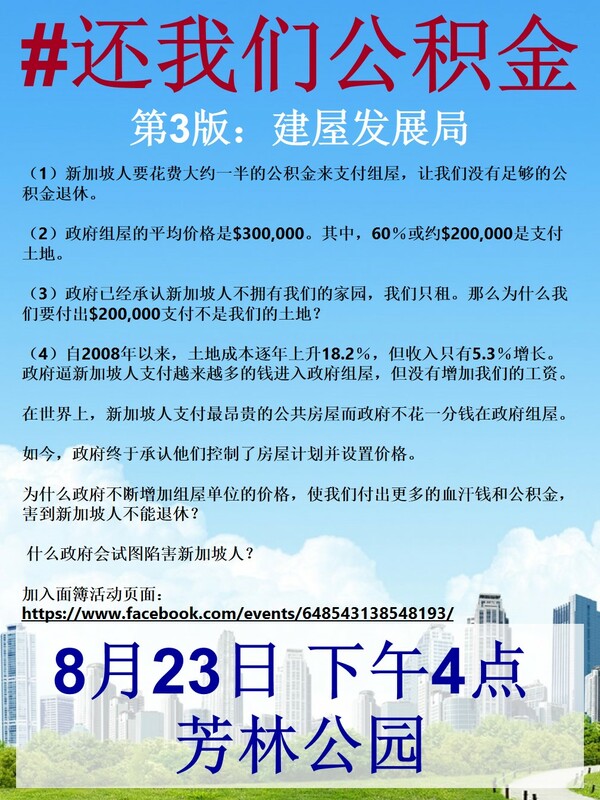 In the second edition on 12 July, we exposed further information about the estimated number of Singaporeans who were not able to meet the CPF Minimum Sum. Your father give you a job as clerk in his bank. With the salary earned, you buy a house that built by your uncle where your father is the consultant (surbana). You cannot afford to buy a car and you take public transports that owed by your father. Therefore your father is stealing your money, and you better kill your father. Don’t you know? What your father earns belongs to you! He must share the bank profits with you! Otherwise you’ll have to wash toilet bowls when you retire!! 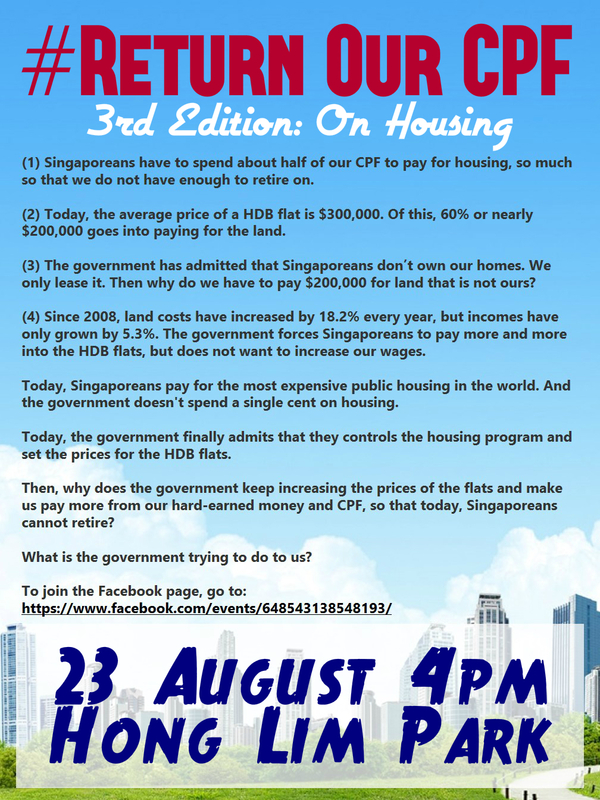 Today, a HDB flat cost $300,000, $200,000 goes to paying for the land that Singaporeans do not own. WORST STILL, HDB is high-rise high-density building. Each housing unit effectively occupies less than 10m² of land. For flats in Pinnacle @ Duxton, that is less than 4m² of land per flat. 4m² is the size of the laundary area. Can you imagine paying $50,000/m² of land to the government? The going rate will be much cheaper for a Good Class Bungalow ($20,000,000 / 1500m² = $13,333/m², freehold somemore), if you can afford it, like our Jet Li or Gong Li. Why are the poor subsidising the rich for land which they do not own and for a flat which they are just leasing from the government? The PAP government needs to open up its book. I bet this is Mah Bow Tan’s idea which our $8 Mr Khaw fully supports. What cooling measures? Singaporeans are being fooled. yes, HBD flats are not strata titled, it’s not the same as leasehold condo, so why are we paying for the land? when condo owners sell their units they are selling their share of the land title, the car park lot, the swimming pool, the playground & etc. HDB dwellers are lessee, they have no share of the land title, they do not own anything, but only “own” the long term rental contract. HDB owners cannot en-bloc to private developer, so why are they paying for the land which they have no use for and does not own? what is the point of paying for something u cannot utilise? so why is there a LAND COST$$ in HDB units? why are we paying for the land? Precisely. That’s why I say the PAP has hoodwinked and fooled the 60% for decades. We need to spread the gospel truth to them. The truth that never see daylight on the news. The truth that has been covered up for decades. The truth that has been denied by the government. On the other hand, the hardtruth must be erased. That is the lie that the government has expounded for years. That is the lie that has blinded many Singaporeans. The lie that brought untold sufferings to our people. Just look at the proportion of elderlies having to collect empty drink cans from rubbish bins in their twilight years compared to any other third world country. We ARE a THIRD WORLD Nation now. @Chris, everything you wrote has been debunked by us. Educated readers just need to go back and read all previous comments to see the clown you are. The 1st generation father win from the high HDB flat prices. The 2nd generation of two children lose because of the high HDB flat prices. 2nd generation = 2 children = two families LOSE. Give one chicken wing to one generation. And then take back an entire chicken from the next generation.. Uncover the truth, let the people judge. btw, Roy, hope you drop me an email for the further discuss , tks. you write so much, even though it is garbage it still takes a lot of effort. is there an organisation backing u with some political agenda? his organization are included the children, the elderly , great majority are not being treated well. it is about 90% was ignored. the agenda is Temasek belongs to the people. In this world we truckloads of ppl who cosplay as journalists, they write truckloads of longwinded bs articles for newspapers ranked below Singapore (which is ranked 150th in 2014) on the press freedom index, does anyone believe they have less backing and political agenda than you? all ur argument were debunk not too long ago. And u r still at it. U r just like Roy. A MOROON? And jasmine, no one force u to buy HDB or condo. In fact, no one force u to stay in sg? Wait, r u even Singaporean? We won’t know, right? Neither do u know if I’m a Singaporean. The way u write is as if u r an uneducated fool. Every thing u ppl wrote had been debunked by me and others. Just becos u r writing on a new article by idiot Roy, u think u can ‘smoke’ ppl? Maybe, if every Singaporeans r uneducated. Unfortunately, education is a cornerstone of Singapore. So too bad. Lastly supporter, if u think 90% r like u then u must have been sleeping the pass 49 years. U and ur friends r the minority. And u and ur friends r getting on the nerves of the majority. LOL, what happened to you? u used to sound more intelligent, now u speak like a scarred animal that just emerged from Sam’s Alfresco Coffee. oh, u still into this debunking thingy? i forgot, thats your job, no problem, i derive great pleasure from subjecting clowns to the sharp hatchet i carry in my bag. Intelligence cannot diminish. That’s a fact of life. Well, debunking untruth is not my job. As u can see my presence here is not as often as before. I do not derive great pleasure to apply ur sort of violence and lies to clowns like Roy and friends. Rather I’d like to highlight to everyone that a lot of falsehood here were actually debunked. So, if ppl want the truth. They need to read the historic comments or go to the official websites instead of here. I totally believe you. The chart is so clear. Only a biased person will deny it. I did my own research, and now I am doubly sure that Roy is correct. We noted that the first month, local writer wrote a letter to Prime Minister Lee, citing deteriorating conditions , Please let this jobless boy stay back. however , Prime Minister Lee refused to let go, start vicious .today, Prime Minister Lee sued Roy is suing all of Singaporean. our question about CPF, about Temasek Holdings, CPF is people’s CPF, Temasek Holdings had shifted people’s CPF. that is our ordinary people’s agenda . Prime minister Lee: Can Singaporean ask ? if Singaporean can not ask, who can ask. our last generation can not ask, what time can ask . the few who benefit-sharing never ask, the most majority are excluded of interests must ask . because of an outstanding question , Prime minister lee wants to kill people again ? today, you kill Roy, is killing our people. the Justice in our side. Supporter, r u an idiot? If Roy represent all of Singaporeans then why so little ppl support his stupid HLP protest? I do not know how others think, I personally suspect that Prime Minister Lee has been a long time, my baby asked me, Prime minister took so much money from where, and my sister even harder. she can not afford to birth a child. many things caused we suffer, they are not honest government. if u say pap clean, that u r idiot. So, just a few hundred ppl or one or two thousand ppl. U ignore the >3m Singaporeans who did not attend? U r ‘good’ at interpretation. Delusional as well. I’m not sure who is delusional here. A few thousand ppl attended the PWP rally. Are you implying that >3m Singaporeans support PAP’s PWP? LOL. Well, if we the CPF ordinary members can share the fruits from all these govt assets under TH by using our CPF trust fund, then our elderlies don’t have to work to the bone, in reality they can retire adequately and comfortably! Why such denial now by TS? Which ever way some wants to see it? It’s been great for many to have contributed to nation building with their CPF in any way, from cleaners to executives! However a cleaner just from everything from the country but refuse to contribute….crying for his CPF to be returned?? If land is not leased to the citizens but “bought” by them, then at some finite point in time, every land would be owned. There will be no other person who have a place to stay… duh.. Simple logic.. most of you are just greedy. Then by your logic, we better convert all freehold property into 99 year leasehold property yah? Nobody here is asking for freehold HDB. if the government wants to charge land cost, transfer the land title to the HDB dwellers for 99years. End result is no different from selling land to private developers for building 99year leasehold condos. if the government does not want to sell the unit together with the land title, it is fair enough to remove the land cost from the selling price. there will never be a case when the land runs out just because too many ppl are “owning” land, because of the LAND ACQUISITION ACT, thats how the government got the land to build the HDBs in the first place. alternatively the government always have other options like using SERS or some other similar invention to “relocate” the ppl, options are plenty, which explains why u are not in government. So what if what you said is the truth. What are u going to do next? You can do nothing. But very soon, a tailored-made muzzle will be install at your mouth. Mind your own business. — Although justice never shoot first. but we follow up. “ Mind your own business ” ? — that is evidence that he had no business, prime minister lee destroyed . Savant is absolutely right. Roy Ngerng is a moron and so are his followers. Roy is absolutely right. Lee Hsien Loong is a moron and so are his followers. Roy, I own your family house and stall too, you know? The loan your parents take out from the bank is partly funded by me. I’m your friendly next-door bank depositor. As part owner, I want a share of your stall profits. Please give me the keys to your house. I want to go into your house whenever I wish. Condo is leasehold too. According to your definition, condo owners don’t “own” their units and land. They are actually “leasing” the units and land. So, your grouse about HDB leasehold applies to condo as well. But why do you target HDB specifically without talking about the same situation faced by leasehold condo? What’s your intention? If you want to “lease” the land, carpark, playground, courts as your as your own unit, then you can go for condo. What’s stopping you? The price difference psf between condo and HDB? Yes, if you want strata-title, you must pay for it. If HDB is strata-titled, you pay for it too. HDB is 99 year lease without land title. Condo is 99 year lease with land title. this is not word play, the difference reflects their relationship with the land, if it does not matter to you, you don’t have to worry about it, you can slowly stew in your ignorant juices. condo is leasehold with land title, no problem, higher price is perfectly logical. if we want to make HDB like condo, no problem, sell it at higher price also, like the EC. but most of the HDBs are NOT EC, so the rationale is, since HDB is leasehold without land title, get rid factoring land cost into the selling price. for HDB you pay for the land but do not own your share of the land. for condo you pay for the land and you own your share of the land. I pay for cost of land. But I don’t own the land. I better vote Opposition to confirm for me. As a tenant in my HDB flats. The PAP government is asking us to pay for the rent 99 years in advance. all HDB documents refers to the HBD dweller as LESSEE, thats a fact. HDBs are not strata titled thats a fact as well. HDB owners do not own any share of the land thats a fact. I am prepared to be corrected if anyone can prove that i am wrong. your 4 letter word outburst merely reinforces the fact that ppl like you are illogical. Roy & Huihui speak for all poorer Singaporeans, as well as for all monthly handed up CPF to them, but no bonus share plan from Temasek Holdings ! We should all withdraw our CPF and to form a capitalists company. And invest in or loan to GIC, TH, HDB and others. We shold make much better returns then the present CPF given to us. July 27, 2014 - 5:29 pm Why Loan To PAP Linked Entities ?? You get better returns by buying shares in Berkshire Hathaway. You also get Warren buffet as your investment manager for free. Dear Uncle Lim, do not need to be so complicated…just park your monies in Thailand and with both the exchange rate as well the interest rate for saving is enough! more than your interest in CPF! BY e way, if you had put on monies in Indonesia for the last 4 years, GUESS WHAT, the total return is amounting to some 29 percent and growing!!! surely the GIC and TH knew about such investment and have taken STUPID SINGAPOREANS AS SUCKERS, MAKING MONIES FOR THEMSELVES, AS WELL AS GIVING THEMSELVES HIGH SALARIES AND BONUSES!! I am just giving a proposal of capitalists company. Surly they are many professional out there can do better investments than GIC, TH and our goverment. First of all, if you want a HDB unit in a central or popular location there has to be a premium attached or nobody would want to live in the less popular/accessible areas. Along the same lines, only if you kill the resale market for HDB units (by, for example, making people sell units back to HDB at original paid price), could you approach zero land cost in the less popular areas. Otherwise the government would simply be handing big windfall profits to buyers of new HDB units when they ultimately sell in the resale market. Hence we follow a market price model. 1) Supply – Build more units which will lead to resale price levels dropping (which also allows new units to be sold at lower prices). On this point the government can be damned if it does and damned if it doesn’t. How many remember all the negative press the government got for building too many units 10+ years ago? Now the government is building more units again but based on the BTO model. This ensures there aren’t whole estates sitting half-empty but it now means too long a wait for many and it is too slow to stop price rises for 3+ years before having a real impact on the market. In my opinion BTO needs to be changed to reduce the 3+ year lag. 2) Grants & subsidies – There are already significant grants available for first time buyers, etc. to reduce of the cost of buying. Added to this, there are government-funded upgrading schemes, concessions on utilities, various payouts and vouchers that favour HDB dwellers over private, etc. Essentially this is HDB unit buyers’ discount or share of the land value – something condo buyers don’t get. A more constructive discussion might be whether the grants and subsidies today are enough or perhaps there are other alternatives. Perhaps the 2.6% HDB mortgage rate should be lower (or lower for the first x thousand, etc.). All the options have a costs or opportunity costs attached and should be carefully considered. Zero land cost is not a viable alternative as it has been proposed on this thread so far. thank you very much , i think ,@The Oracle is a gentleman. but DMP denied the capital fund of Temasek Holdings was the part of cpf, it is dishonest. Like money laundering, as the people’s money, wash into their own money, and that few shareholders reap the profits. This highlights the huge disparity communities, one in Singapore, two societies. If I don’t own my HDB flat. Why am I paying property tax? They don’t pay property tax. The landlord pays the property tax and it is at 2.5 times the rate charged for an owner occupied dwelling. Essentially part of the rent paid by the expat will pay this property tax – so they are indirectly paying much more than you are in your HDB flat. You have no real answer and thus you resort to insults. Sad. I don’t get this “land” cost thing. Basically you are leasing (or renting) from HDB for <99 years. As a rental unit, the rent is definitely based on location. HDB is always the landlord as it ultimately owns the land and structure after 99 years. The issue here is that people are paying significant portion of their income to HDB in order to "own" (lease) a flat. A significant portion of the population are unable to "own" (lease) a flat. People need to reevaluate the purpose of PUBLIC housing. Does it make sense when the price of a public housing rental unit is higher than the cost of a single family home in other developed countries? In the 60s and 70s, HDB was PUBLIC housing. Today, it is operated like a private FOR-PROFIT corporation (same as transport and utilities in Singapore.) This is not a NORM in most developed countries where public housing, public transport and public utilities are non-profit entities and usually subsidized by taxes from higher income taxpayers. PAP policies have gone overboard over the past 2 decades as reflected in the widening GINI index. It is time to move the policies away from unfettered capitalism when even public services are privatized for profits. To think that PAP will voluntarily change course is wishful thinking as witnessed in the PWP fiasco. IMHO even WP will be too "slow" to make necessary drastic changes. Why waste time on this group of idiots? They simply don’t care what you are trying to them and just cling on to their illogical rant! Let them be and the sane can see how idiotic they are in this Prata flipper site! True Alan. I know I’ll never convince them – their hate for PAP overrides everything. What I can do is poke (huge) holes in their “facts” so that their impact on some innocent people who may come across this site is at least diminished. metaphorically, Immigration is like a type of drug which’s dosage have to be increased each time it is consumed. how sustainable do you think it is? now, there is no reason to believe that at 6.9m the TFR is going to go into reverse, when exposed to the same economic realities and stresses of our high speed hamster wheel system, the new immigrants would assimilate our TFR rate instead of behaving in a counter intuitive manner. assuming the 30% increase calculated by the govt agency’s experts from 5.3 to 6.9 is correct. solution is 8.97m population? This is not sustainable because if the TFR does not come up, we cannot even stop at 8.97m, it will be endless. immigrants eventually grow old, with the same TFR as us, they cannot solve our population problem, they only strain the infrastructure now, and add to the absolute amount of old ppl when the time comes, this is not a solution. 8.97m at 1.29 TFR is a much bigger problem than 5.3m at 1.29 TFR for such a small country like ours, the stress on our healthcare, land and transport will be incredible. time to robustly examine the real reasons why we need so many immigrants, is it a strategy which is good for us? or is it a strategy which is good for some ppl who want to have their cake and eat it too, at the expense of our quality of life? will be hold ourselves to ransom when we build for 6.9m, then we are forced to either have over supply infrastructure or accept more immigrants? isn’t it going to end up as a self fulfilling target? if it is, what does it mean for u? what is is the emigration numbers for SG? nobody know. it’s a secret. maybe u know why. will we hold ourselves to ransom when we build for 6.9m, then we are forced to either have over supply infrastructure or accept more immigrants? isn’t it going to end up as a self fulfilling target? Many condo is yours for 99years. It’s officially called leasehold too. It’s strata title deed is official leasehold for 99 years. It’s as LEASEHOLD as any 99-years HDB is. Don’t muddle up the issue because you just want to talk about HDB only. For condos, I can sell to any foreigners. I am not encumbered by any race quota. I can decide to enbloc. I can build new facilities on the land. I can fence up the land and bar you from entering. HDB is public housing, not private housing. Government must not make profit from it. It is duty of government to ensure everyone has a roof. Land cost should never be factored in. HDB can choose build where it wants. But the people must be able to afford without affecting their retirement. This government has lost its plot. It doesn’t even aware its duty and responsibility to its people. The only way forward is to vote out PAP. A lot of people here are trying to cause confusion between leasehold and rental. Leasehold is ownership. Rental is not. You own your HDB flat. You can do many things with it including renting it out. If you rent/lease a HDB, you don’t own it. You can be kicked out next month. You can be asked for higher rents next month. Cumulatively, you’re paying a much higher premium in rent than if you’re buy and own the leasehold. You’re at the mercy of the leasehold owner. Get it or not? Leasehold is ownership. Don’t anyhow muddle things up to achieve your motive. it’s on record in the Hansard, as we can see, HDB owns the land as the landowner, not the HDB dweller. Mr Khaw Boon Wan agrees with me, end of story. Wrong, legally leasehold is ownership. Whatever being said is the same as for leasehold condo too. It’s not just for HDB only. What’s more, leasehold is the same elsewhere in the world. So, what’s really your complaint? That the concept of leasehold as applied to condo (too) and everywhere else in the world is morally wrong? If that’s your complaint, don’t say HDB only. It applies to any leasehold, including condo and everywhere in the world. If you’re keen to own a freehold, buy one. If you alright to own a leasehold, go for it. If you only want lodging, you can rent. There’s no right or wrong. It’s up to you. Same as for a commercial business, it can also choose to buy freehold and build it’s own, or to own a leasehold building. Or it can also pay monthly rent for a place. It’s a choice what you want to own or even just to rent. Stop muddling things. By the way, for leasehold condo, when the time is up, the land goes too. Don’t be mistaken that you “own” the land in the sense that it’s yours forever. Leasehold condo is as leasehold as HDB can be. You are the one trying to confuse people. Condo is private housing meant for the rich. HDB is supposed to be basic housing meant for people who cannot afford condo. The former is not subjected to HDB rules. NEA people cannot anyhow enter. Mr Roy, waiting for your rebutal to government didn’t use CPF to invest in HDB, By the way, CPF withdrawn under the CPF investment scheme is decided by individual members to buy shares in DBS, Singtel, etc. If so government doesn’t use CPF to invest in DBS, Singtel. CPF is also use to buy private properties, buy shares of non TH companies. Is the sh*t you are spouting the reason why you are not in parliament? HDB owns your HDB flats. b)your 10 year old son cannot inherit your HDB flat. The above are just 2 differences between between an owner of a 99 year HDB LEASE versus an owner of a private property with a 99 leaseHOLD. this sentence beautifully captures the frustrations of a illogical person like a well taken photograph. I have observed you spouting rubbish for a while now, and you have the “I am holier than thou” attitude. That explains why you’re furiously typing online, while the rest of the world goes on about doing real work. blind allegiance to any party is a silly idea, that includes all parties. no party lasts forever, it’s a choice between buying insurance and being a sitting duck. an insurance might not be perfect at first, but it can be gradually improved over time, if you don’t start, there will be nothing to improve on. an employer with foresight will groom alternatives to his best employee, when the inevitable happens, one of the alternatives can take over. the added advantage is this best employee will perform better due to the competition. a myopic employer will have irrational blind faith with his best employee, and will start to panic when this employee turns rogue then he’ll find that the only candidate left to take over is the lazer printer. predictably, the alternatives will not necessarily become better than your best employee overnight, thats not a problem, you don’t have to get rid of your best employee immediately, if he is still good, u keep him, if the competition makes him better, good for u, but you know that if bad things happen, you have options. I agree with you – good analogy. It will be a disaster if government sell HDB at cost price without factoring land cost and market value. The whole Singapore property market will crash and many people that have bought flats / condos will go bankrupt as the value drops and they can’t service the loan. This is quite straight forward outcome yet so many people can’t see it coming and keep crying foul?? And it was the PAP that created this problem in the first place tio boh? – bring in new management to solve the problem. It will be an even bigger disaster to continue to vote PAP … a party whose only vision/solution for Singapore is to import more aliens … and pray that it will work. basically this whole “ownership” thing is based on allowing ppl to trade pieces of lease on the market for 6-7digit sums, the selling point is a carrot which says u keep the profit, this whole exercise is used to justify that u “own” something. we all know most of the profit cannot be taken out anyway and the more ppl profit, the more debt we are borrowing from the next generation. it might work for the first 50years when the leases are relatively new and everyone trades blind to the lease left, perhaps as blind as GIC is blind to the source of funds it uses. but as we know from Mr Khaw Boon Wan’s answer to Gerald Giam’s question, eventually the value runs down to zero when the lease is up, going forward, is it still logical to trades pieces of leases at 6-7digit sums when the leases run down? and when that happens, isn’t the whole strategy of asset inflation and monetisation for retirement self defeating? property goes in cycles, we ask the retiree to put all the eggs in one basket and if he retires on a down cycle, what is going to happen to him? rather than inflating property prices to attempt to make up the difference, better pay our workers properly and let them save up for retirement instead of making them spend so much on housing, and effectively is at the mercy of the property market. July 28, 2014 - 2:47 pm What Type Of People Have We Voted Into Government? – Continually encourages its citizens to inflate property prices? the argument government has for increasing drawn down age and minimum sum for CPF is longer life expectancy, well, since life expectancy is longer, how about increasing the lease to 120years? apparently the logic something not quite right isn’t it? it’s like someone who sell u something, he say now the quality is increase therefore it theoretically last longer, therefore more expensive, BUT warranty period stay the same as before, not logical right? the minimum sum you know how to increase but the lease don’t know how to increase? July 28, 2014 - 2:50 pm What Type Of People Have We Voted Into Government? – a government of the people, by the people, for the people. Yes I agree that the property inflation is created by the governement. However, it has benefitted a whole generation of people who are now in their 50s and 60s. Going forward we cannot reverse the situation as we are more or less stuck with this but need to still exercise control in the property markert as what we are doing now. The 1st generation Singaporean father win from the high HDB flat prices. And then take back an entire chicken from the next generation. Leasehold is not ownership. It’s a contractual agreement that a HDB flat dweller (to use owner is a wrong term) has with HDB which is the legal owner of all HDB flats for such lease over a period of time as stipulated ie 99 years lease. If you own a piece of pte property you have no problem with getting a loan from the bank all things remain constant. But not so with HDB flat! Can someone confirm this? The questions every HDB flat dweller is asking: Why we have to pay property tax when we are not the owner? Relating to this question, why we have to pay for the cost of land other than the cost of flat since HDB is the rightful owner of the land? July 28, 2014 - 6:04 pm HDB As The Owner & Landlord - Is HDB Paying Its Fair Share? If HDB is the owner of the HDB flat. Why do we tenants have to pay for “our share” for the lift upgrading? Do expats in rental condos ever pay for the lift upgrading in their condos? Do expats pay for swimming pool upgrading? two, Lee’s wife to be tried, Temasek Holdings return shares back to CPF account. four ,voting a new prime minister . Since you have so much air, why don’t u do what Prata did, show your guts by challenging LHL on all your claims. I believe he will give you all the attention you want than just farting loudly here. At least Prata did his by putting his neck out for you even though I felt is pretty stupid and illogical! For the 5 decades that is ruled by the PAP, the government is getting richer and richer while the people are getting poorer and poorer. The income and social inequality has widen. Tharman said will fix up the problem but apparently there is no solution. He is just dragging on with time. Now with this CPF saga thingy, tharman again said there will be more changes, but probably even after a couple of years later, nothing or little will be achieved. Instead of waiting for multiple changes to the different systems, let us change once and for all – the government. PAP and Tharman will only listen if we vote for Opposition. 1 minute in the voting booth. And we get a pro Singaporean government. which country can solve the rich-poor income gap? PAP has solved the rich-poor income gap for the rich. Did Temasek Holdings Use Singaporeans’ CPF To Invest? yes of course. never doubting about that ，we multinationals still waiting for bonus share with them. if singapore leader dishonest , he shall involve an international lawsuit. Hey Roy, I just want to say again that I am truly amazed and in awe of your grit and tenacity throughout the past few months. Detached from any political party in Singapore, your steadfast conviction and never-say-die attitude in trying to expose the inner workings in the government machinery has proven you to be the sole, biggest nemesis the PAP club has seen in decades. Who’s to expect it is just 1 man, the proverbial David? I salute you. Never give up the fight! Please face the reality that PAP will continue win. Nobody dare to vote PAP out. Singaporean have no guts. Heya we’re for that main time frame below. I uncovered this panel i locating It truly helpful & them helped me out lots.. email autoresponder I hope to supply anything backside plus assist people as if you served us.